Kayla is from Grand Rapids MI where she received a bachelor’s degree in exercise science from Cornerstone University in 2010 and a doctorate in Physical Therapy from Grand Valley State University in 2013. Kayla was a student-athlete competing in volleyball and track and field and was captain of both teams. Kayla was an Academic All American as well as all American in the pentathlon. Kayla has coached volleyball at the middle school level as well as up to University level where she was an assistant coach at Cornerstone University for 2 years. Kayla has worked in outpatient orthopedics for 4 years and part-time in a skilled nursing facility. 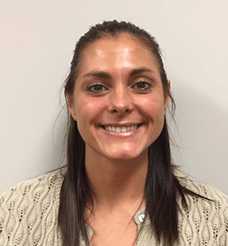 Kayla’s professional interests include geriatric physical therapy, sports rehabilitation, and dry needling. Kayla is a Body Pump certified exercise instructor, is active in her church, enjoys exercise, and plays beach volleyball. Certified Body Pump Instructor: Les Mills International. Continuing Education: Dry needling, cervical manipulation, kinesiotaping, postural reintegration.